← Oh The Places You’ll Go – What One are you Going to Choose? What an incredible book! Claude has such an amazing ability to teach timeless principles through stories and humor…. Usually a lot of humor! I can’t wait to read your book, one day, Wayne. Your story, like Claude’s, is so inspirational to so many people. Amazing blog article Wayne! The way you speak of Claude is spot on! His book is phenomenal and I can’t wait for the next one next Friday! I’m also thankful for being in business with both you and Claude. such a complacent world we live it, it’s so important to grow a spine. I have known Claude Hamilton for over 13 years now and he is a true model of attitude, character and courage. Since the day I met him he had true posture and I knew I could believe what he said. I consider him the biggest influencer in my life and I would go to battle with him and for him without hesitation. This book “Toughen Up” is an amazing read and will definitely be a best seller. I know what I will be giving out as a Christmas present this year to everyone I love and care about, a copy of this book. Thank you Claude for sharing your life with the world! Keep stroking!!! Its kinda kool to re-live some of those moments from Claude’s past. Great blog Wayne! I loved the book. Its an amazing read, and I believe that something of this calibre should be followed up with an additional release. Its way to good to be a ‘1 off’. Thanks for leading from the front. Claude is a fantastic leader and a great mentor and a number 1 pick if your looking for a role model in business. Awesome first book, Toughen Up. Home run !! Such an excellent description of Toughen Up, Wayne. Claude’s book exemplifies all that he and Lana stand for. They are outstanding leaders…who lead with their whole hearts…as well as mentor many others who follow in their footsteps. His examples of each principle in the book show constantly in their day to day life. Toughen Up is a must for every family. I will personally recommend it to everyone I meet. Thanks for sharing, Wayne!! Its a great Christmas gift for sure. Have a few copies all ready to go! Claude is an inspiring leader and an amazing business partner. A top pick for a role model in Life and Business. 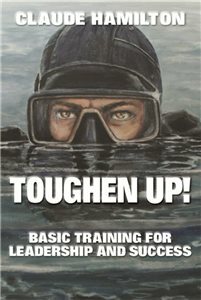 Ammazing first book, Toughen Up. A home run for sure. Every inspiring leader needs a mentor worth following, Claude is that mentor to many. Fantastic blog Wayne! Claude’s book Toughen Up is well written, and an easy read on courage, determination, duty and honour. Looking forward to reading your book sometime soon! Thx, Claude is a warrior champion. Heh Wayne – I’d be interested to see what you and Claude could do along the lines of collaboration for writing a book – I bet that would be a best seller very quickly as well. Thanks for leading from the front – and for being a great protege and ‘Toughening Up’ along the way. Thx, yeh that would be fun. That would be an AMAZING read!!! Thanks for this post Wayne, Claude’s inspiring book released just a few weeks ago is already making a positive impact in the lives of so many. I agrre Wade, his impact is priceless. Great post, It’s a great book that has me remembering a lot of the stories that I’ve come to know over the years, and also getting some of the thinking behind it. It’s truly different thinking about his experiences from the military, I can relate to some of the thinking with my past military service. I know that I’m a slow reader, but found myself driven to finish the book, you want to cheer him on even if you already know the outcome. Claude’s attitude and character is something that everyone should be striving for, this world is short on role models these days and he’s a man to get behind and/or run with. Thx for the kind words Linda, keep rolling. Great job on the blog! Wisdom from Claudes book and Wisdom from you! Love it! Can’t wait for the next one. Great info is out there its just not usually along side the check out line in our nearest grocery store. Thx for the kind words bud. Great blog Wayne! Claude’s book was amazing. I loved hearing his story and how he tied it in with teaching. I can’t wait for your book to come out!! Thx Ben, Apprec you. keep rolling. Excellent summary of the first three strengths Wayne! Everyone should be reading Claude’s book Toughen Up! Leading by example in these three strengths is something you and Claude are both incredible at. That is another reason I like his book so much. Claude gives examples of times in his life that he had to exemplify these strengths. It is a great book for anyone in the dream struggle victory stages of life. Very well said Wayne. You’re admiration and loyalty is certainly present in how you write about Claude and with good reason. Although our business experience with Claude and yourself for that matter isn’t a decade strong, our feelings about who Claude is, is virtually the same. His book reads as such a testimonial to the “Never Give Up” persona and leader that Claude is and will always be. Agreed, never give up is Claudes attitude all the time. I’d second that. Well said! Wow!!! What an amazing post Wayne! To think a former blue color a.k.a welder toughen up enough to change his stars!! You have shown us that any body can change their future…all you need to do is “toughen up” Claude’s book is inspiring and a true game changer!! I’m so grateful to be part of such an elite team of leaders!! I look forward to your next blog Wayne!! I Love Claude’s new book packed with wisdom that will change your life if applied. Wayne what is fascinating is that in ten years of you knowing this amazing leader( Claude) you have rose to carry the torch for freedom in Leadership with him. Great blog, Wayne! You actually remind me a lot of Claude. I love the way you guys teach from the heart. Claude’s book is amazing! Every person on the planet needs to read it. God bless! Such an amazing book one that all should read, Claude Hamilton is a true champion of life for he is a winner, never giving up always fighting through and learning from mistakes. Just like yourself Wayne the positive impact that Claude had in your live and now you reflect in our lives is amazing. Such an amazing journey and to have not given up to have stood for the principals of honor, integrity you are both giants and with Remembrance Day just days away we all need to bow our heads and give respect to those that have served their countries just as Claude did ours. Thank you Claude for laying it out the way that you did the book is a fantastic read and for stepping up showing us to be men and leading in a time when leaders are few. Thank you Wayne for the Blog you certainly are following in Claudes footstep learning from the master and now are becoming one yourself. We can’t wait to see what is next for this journey of Life has only begun and millions of lives will be touch by everyone one household at a time. Great blog Wayne! Reading ‘Toughen Up!’ right now and it has been amazing so far. So much knowledge and wisdom in each page, it’s hard to put it down. Great post Wayne. Toughen Up is an excellent account of the struggles and victories Claude and Lana have faced and a great picture of the leaders they have become through it all. Great principles for all of us to learn from. You and Raylene are awesome examples of the students following their mentor’s lead. We are so thankful for your guidance and encouragement. Fantastic Blog Wayne What an amazing book!! Like you said -Anyone, in any profession, at any stage of their life will benefit from the knowledge they gain from reading TOUGHEN UP! The principles are universal and the values are timeless. I will be sharing and recommending this book with family friends and any one I meet!! I really enjoyed your blog tonight. It is very clear that you and Claude have established a bond the is unbreakable. The lessons shared by Claude in Toughen Up took him a life time to learn and now we all have the opportunity to learn those lessons in hours instead of years. It takes real courage to be able to share from the heart like that. I look forward to having the same kind of relationship with my mentor. Thanks for being the example. Thanks for the blog Wayne. Im proud to follow great inspiring leaders like you and Claude. I cannot wait to join you in the ranks of business. Claude’s first book has been an excellent glimpse into his fantastic leadership journey so far and I am looking forward to many more books from you and him in the future. Its great to be able to stand on the shoulders of Giants! What an excellently written representation of who Claude is to you and will be to the new up and coming individuals. A lot of the character traits that you admire in Claude are the traits Alex and I admire in you and Raylene. Thank you for expecting nothing less than the best. Great blog Wayne. Claude’s book is a great inspiring story of the dream struggle victory, thanks to you both Wayne and Claude for always leading from the front, great Servent leaders alway teaching from the heart. Wayne, I can’t wait to read your book one day.! Great blog Wayne!! Toughen Up is a book that is hard to put down. Both you and Claude are such amazing people. You both have became what all dream to be. True genuine role models. Very admirable. I’m blessed to have you and Raylene in my life. Raylene and I are proud of you and Sam for wanting to chase your God given dreams. keep rolling we will see yas soon. From the beginning page, Toughen Up goes straight to the heart of what’s missing from much of Canadian culture. Wayne, you and Raylene are an excellent example of people whose lives demonstrate Attitude, Courage and Character on a daily basis. Thanks Wayne for sharing. LEAD ON! Great Blog Wayne Claude and yourself are such powerful examples of what can be accomplished when you have the right information and the right thinking. Claude’s book “Toughen Up” is written in a way that gives information with real life relatable examples. It is such a great way to learn.